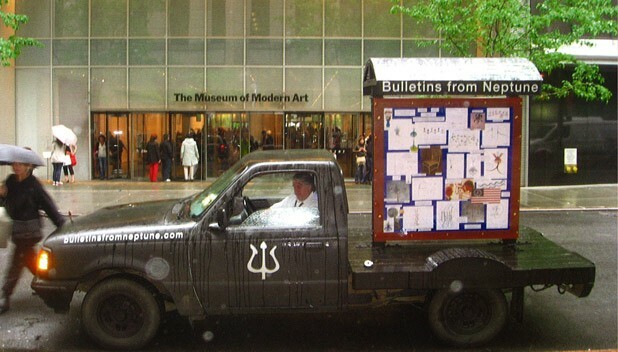 WTF: What's the story behind the Bulletins From Neptune pickup truck? Tom Mulholland in New York City last May. WTF? A new kiosk delivery service? A low-tech advertising campaign for Trident Seafoods fish sticks? A religious zealot announcing the ancient Roman holiday of Neptunalia, which falls on July 23? No, no and hell no. In fact, the roving bulletin boards are the handiwork of Tom Mulholland, 63, a Middlesex master plumber by trade and lifelong artist, sculptor and poet by avocation. Seven Days caught up with Mulholland recently at Burlington’s City Market, where he had stopped for dinner — strictly vegetarian, he emphasizes, in a baritone that retains his native Long Island accent. As artists go, Mulholland exemplifies the adage “Don’t judge a book by its cover.” Huskily built, with meaty, workingman’s hands, and wearing a faded ball cap and black T-shirt, he looks the part of the stereotypical, rosy-cheeked plumber who shows up at your door at 7 a.m. to snake out a clogged toilet. So when Mulholland talks about consciousness-expanding meditation, astrological charts and the history of collage in the 20th century, it seems as incongruous as a drill sergeant reciting Shakespearean sonnets. Two more marriages, a six-year stint in France and several self-built homes (or “nest sculptures”) later, Mulholland was back in the states, on his own and spending his free time away from leaky faucets to pursue more creative endeavors. Mulholland’s truck, or “vehicle as vehicle,” as he calls it, is his latest effort to share with the world what he claims is an entirely new form of expression: bulletin-board art. To wit, Mulholland’s truck displays a hodgepodge of seemingly unrelated works: sketches, paintings, aphorisms, philosophical ruminations, poetry and photographs of his other creations. Among the snapshots are one of a “plumber’s marriage bed” built from welded copper pipes; an 80-foot-long pedestrian bridge that spans a creek in Worcester, Vt.; and an unusual painting of Old Glory as an astrological chart for a nation “born” on July 4, 1776. The last, titled “Starry Eyed America,” was originally used in a performance piece Mulholland says he and two friends did on Flag Day in 1979 outside the Betsy Ross House in Philadelphia. The trio reenacted the fife-and-drum scene from the famous “Spirit of ’76” painting by Archibald MacNeal Willard. On that same day, Mulholland recalls explaining his own painting to Buckminster Fuller, who happened to be giving a keynote address on the origins of the American flag. “He was also a Cancerian,” Mulholland notes. The reaction to his mobile-art installation — yes, it’s street legal, he says, and surprisingly aerodynamic, despite its size — has been mixed. Mulholland expresses some disappointment at how few locals have asked him about the truck, versus tourists and other travelers, who seem far more curious. He also acknowledges an existential inevitability: His body won’t be able to handle the physical demands of plumbing work for much longer.